Compared to today’s high-definition games, DOS games used low resolutions, so playing old games in DOSBox on a modern LCD monitor or HDTV is not an optimal experience without some configuration. The dosbox.conf file controls how DOSBox displays old games and software. 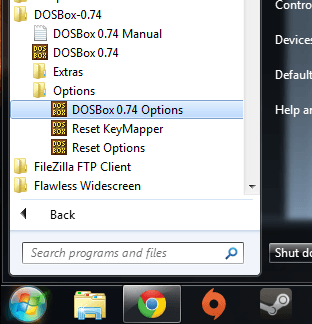 These settings can be changed by opening the DOSBox Options from the Start menu. Open the dosbox.conf file via the Start menu. First, I change the line that says fullresolution=original to fullresolution=1920x1080, which is my monitor’s native resolution. If your monitor is different, be sure to use its resolution (e.g. 1680×1050, 1366×768, etc.). Next I change output=surface to output=ddraw to allow for scaling and aspect ratio correction. 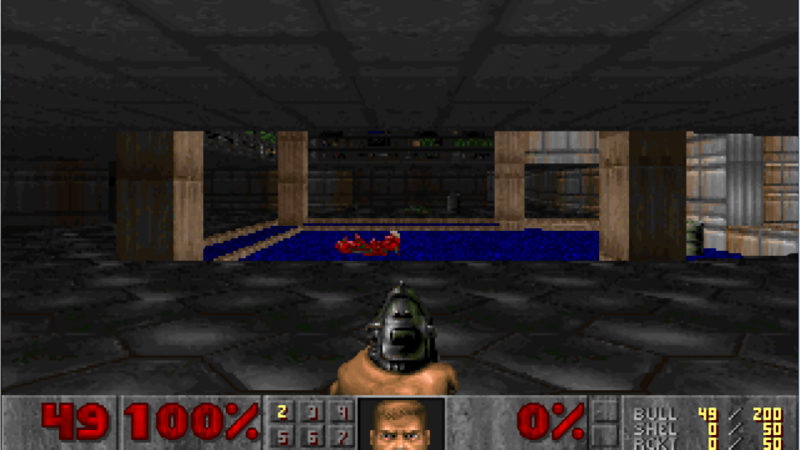 Some DOS resolutions do not use square pixels, so aspect ratio correction keeps these games from looking “squished” on the screen (old CRT monitors did not have a fixed number of pixels, so this was not an issue back in the day). Once the output is set to ddraw, we can enable aspect correction and scaling. To do this I change the aspect=false line to aspect=true. Right after that I like to change scaler=normal2x to scaler=hq3x. This will depend on your personal preference and the speed of your hardware. hq3x scales the image up 300%, but it can make things look a bit “cartoon-ish” because it smooths pixellated edges. Notice how the large red numbers in the screenshots below are pixellated in the first image but smoothed out in the second image with hq3x scaling. The results vary depending on what’s being displayed on the screen, but something is better than nothing. DOOM enlarged with no enhancement or scaling. 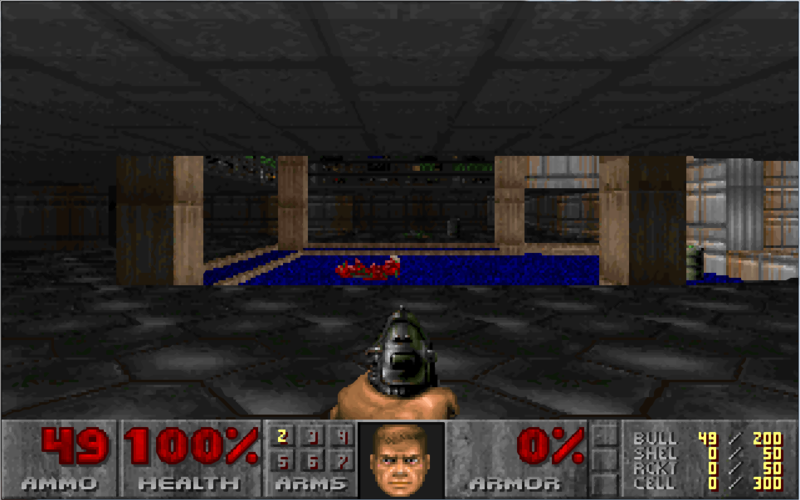 DOOM using hq3x scaling in DOSBox. Just for comparison, here is DOOM at its original resolution. It’s amazing how much information game artists were able to cram into so few pixels. 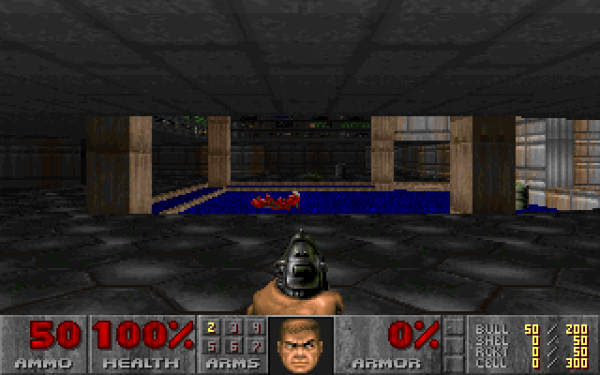 DOOM at its original resolution without any scaling or enlarging. As I mentioned, these settings are my personal preference, so you may want to experiment to find settings that look good to you and give you the performance you want. I know this post is from last year, but I’ve tried doing what you have said with the latest version of DosBox (on Win 7) but I still get my games running in a very small screen (I’m trying to load Duke Nukem 3D Atomic). I’ve even tried changing the window properties of DosBox, but to no avail. Do you have any other tips or things to try?